The Linksys Wireless-N Dual Band Ethernet Bridges (WET610N, WES610N) allow wired Ethernet-based devices to connect and access the Internet wirelessly. To learn how to get the current wireless settings of your Linksys wireless router, click here. For Linksys Smart Wi-Fi users, you may check the wireless settings of your Linksys Smart Wi-Fi Routers by following the instructions here. NOTE: If you’re using a non-Linksys wireless router, refer to your router documentation or contact your router manufacturer for support. Connect the router to the computer by using an Ethernet cable connected to the LAN port of both devices. Once done, connect the bridge to the router using an Ethernet cable to another available LAN port on both devices. QUICK TIP: If you want to configure the WES610N v1 without connecting it to the router, you can use 169.254.1.250 to access its web-based setup page directly. If you have a WES610N v2, its default IP Address is 10.100.1.1. For complete instructions on how to set up the WES610N v2, click here. NOTE: The setup should look similar to the images below. Device image may vary depending on the type/model of computer, router and Ethernet bridge you are using. To know more about the basic parts and functions of an Ethernet bridge, click here. Launch a web browser on your computer such as Internet Explorer. Enter the IP Address of the bridge in the Address bar. QUICK TIP: For the Linksys Wireless-N Dual Band Ethernet Bridge, you will need to check the router’s DHCP Client Table to identify the bridge’s current IP Address. To learn how to check the DHCP Client Table on your Linksys Wi-Fi Router, click here. For Linksys Smart Wi-Fi users, click here. Leave the username blank and enter “admin” in the password field. NOTE: If you are unable to log in using the said credentials, reset the bridge to factory defaults by holding the Reset button with a pointed object for 10 seconds. After resetting, it may take a few minutes before you can access the web-based setup page again. Set the radio button to Manual then enter your Linksys router’s Network Name (SSID). Select the Security Mode that matches your router settings. NOTE: For more information about setting up your router’s wireless security, click here. Enter the passphrase or network key based on your router's security settings. Click on Status > Wireless Network. 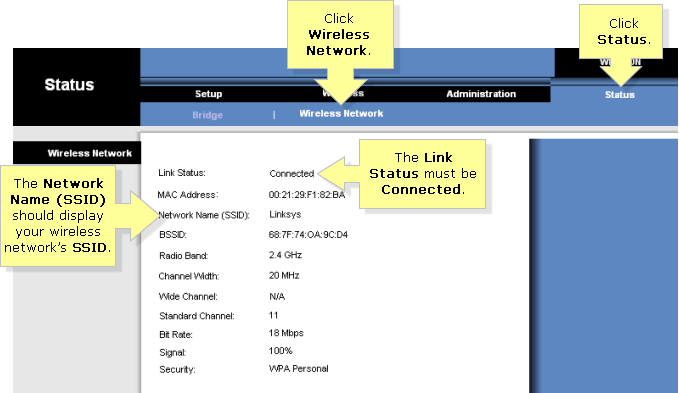 The Link Status should say Connected and the Network Name (SSID) should display your wireless network’s SSID. Connect the bridge to any of your Ethernet-enabled device using an Ethernet cable. The bridge should now be synchronized with the router.